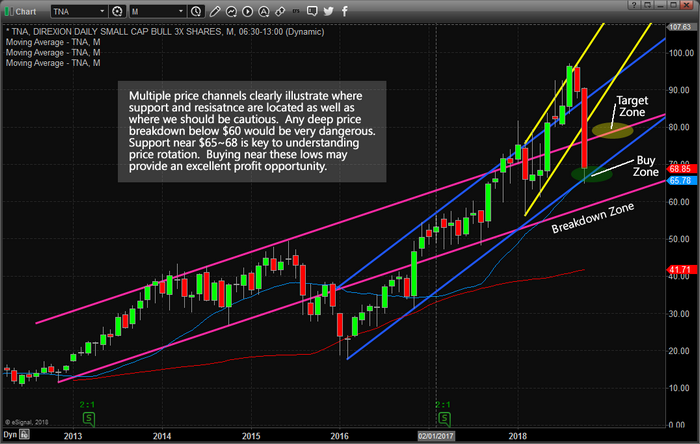 Skilled Traders Can Find Profits In Small Caps – Technical Traders Ltd. The Small Cap ETF, TNA, is setting up a nearly perfect example of a quick in and out trade for a potential profit of 8% to 15% or more. We understand the fear that many traders may have in the markets right now and we understand the reason why many experienced traders decide to sit on the sidelines while these types of moves play out. Yet, we believe the opportunities that exist while these volatile market moves are playing out are some of the best setups for experienced and skilled traders. Typically, volatility may only be only 20% or 30% of the current volatility on average trading days. In other words, you might be waiting 3x to 4x (or more) longer for the same types of price swings to occur. If the opportunity presents itself and you have the skills and understanding to dissect the trade, why not take the opportunity for these great, quick moves? This Monthly TNA chart illustrates the Price Channels that our research team has suggested present the opportunities for this LONG trade setup. Our research team believes the primary BLUE price channel is acting as support for the current price near $65~70. As long as this lower price channel holds, then the potential for an upside price reversal towards $78~80 is rather strong. The MAGENTA target level is price resistance from 2013~2015 and would be an immediate price target for any relief rally from these lows. The Breakdown Zone is where we want to alert our followers to be cautious. If the price does not rally and falls below the Breakdown Zone, this trade is invalid. 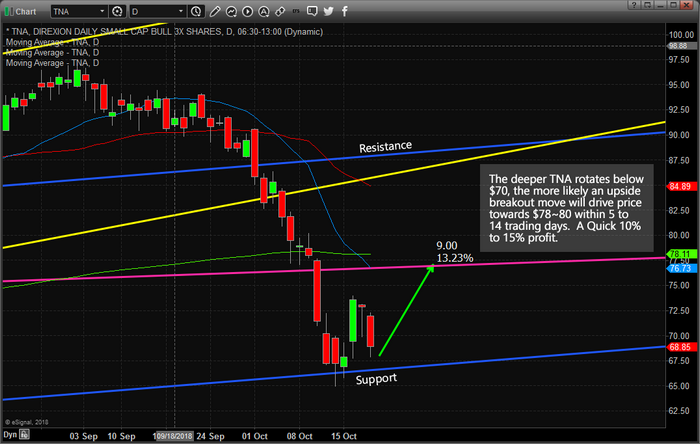 This TNA Daily chart more clearly illustrates the trade setup that is currently setting up. The relief rally on Tuesday, October 15, rallied to near $74 from lows near $65. This type of price rotation establishes a price range and shows us what is capable if the price were to enter a rally mode. Again, the MAGENTA level is our immediate price target for any new long trades near these lows. Our opinion is that any new long entries below $70 are sufficient for most skilled traders and, of course, waiting for deeper price entries could be very advantageous. Don’t get greedy with this one just yet. We still believe the price will rotate lower after reaching near the target zone and form a major price bottom near November 8~12. Think of this as a scalping trade. Once you have entered your long position, any price level above $75 is sufficient to call this one a “solid winner”.